SPAIN has had a long and fruitful relationship with the tomato. A prolific grower and consumer, the country produces one fifth of all Europe’s tomatoes and is one of the most enthusiastic tomato-eating nations in the world. 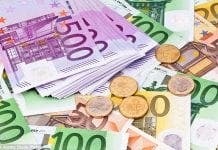 The rest it exports, principally to the UK, Germany, the Netherlands and France. Although it’s hard to imagine, the juicy red fruit wasn’t always an irreplaceable part of Spain’s Mediterranean diet as it is now. Tomatoes are natives of the New World and were brought back to Europe by Spanish conquistadores in the early 16th century. The Spanish tomate comes from the Aztec tomatl. But because they are part of the nightshade family of plants, which are poisonous, Europeans were suspicious of the new fruit and used them as decorative plants. 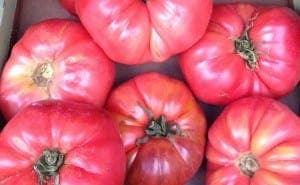 It took almost 200 years for tomatoes to become an integral part of Spanish cuisine. 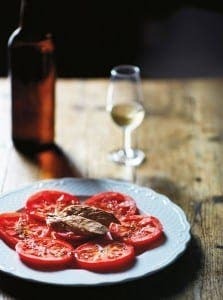 In Spain, tomatoes are used ad lib in salads and cooked meals although labour-saving canned products like tomate frito – ‘instant’ tomato puree fried in olive oil with a hint of onion and garlic – are also popular. The classic Spanish gazpacho is perhaps the country’s greatest homage to the tomato. The oblong Roma variety is typically used for this chilled summer soup along with bell peppers, bread, olive oil, vinegar and garlic. Salmorejo, a thicker version of gazpacho and pisto, a type of ratatouille, are also tomato-heavy. And sofrito, a chunkier blend of tomato, garlic, onion, and paprika, serves as a base for a multitude of Mediterranean dishes. Spaniards love tomatoes so much they celebrate them with the traditional Tomatina food fight festival, held in Valencia later this month. With such a tomato culture, it’s no surprise that Spanish growers produce some of the tastiest varieties in the world. 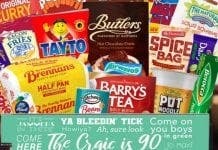 But for the pick of the crop, you have to venture beyond the aisles of your local Spanish supermarket. 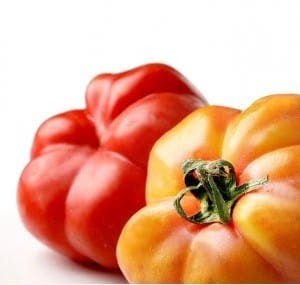 he Pyrenees, this pink tomato has long been cultivated in small plots in the province and is traditionally sold in local markets around Huesca. 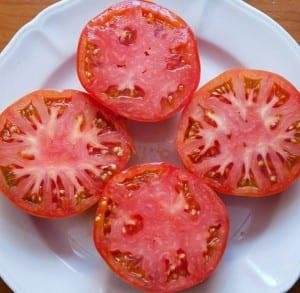 Larger than the bog standard variety, with thin pinkish-coloured skin and a fleshy interior, the tomate rosa’s sparse seeds and intense flavour is becoming increasingly sought-after in Catalonia, Madrid and northern Spain, and is best appreciated in a simple tomato salad. This little-known variety is reared in Huelva’s Aracena mountains. The tomate rosado is large and plump with a delicate skin that requires wooden boards to prevent the fruit touching the ground and rotting when ripe. It has a delicate, sweet flavour and is traditionally eaten either fresh, or bottled for the winter. The pink fruit is the key ingredient in a local dish called distraído, bread topped with extra virgin olive oil, tomato pulp and thin strips of tocino Ibérico. Catalonia’s heritage tomato is named after the holy mountain of Catalonia and Our Lady of Montserrat, patroness of the region where it has been grown for generations in El Vallès. Devoured by the locals, it was not more widely known and grown until recently. Considered one of the prettiest tomatoes, the Montserrat’s flawless, undulating form seems carved from red wax while slices of its sweet, juicy flesh have a floral design. Perfect for stuffing and baking, the Montserrat is also delicious in salads with Figueres onions and white beans, drizzled with extra virgin olive oil. This fashionable hybrid hails from the ‘plastic fields’ of Almeria, the triumphant result of crossing traditional tomato varieties. Thanks to the mild climate of its birthplace, it’s available in abundance from December to April, a rare winter fruit. Characterised by its flattened shape, grooved sides and dark green streaks, the darker the colour the sweeter the fruit, though it’s still high in acidity. Rafs ripen from the inside out, leaving the skin firm and crisp and the flesh juicy and sweet. Highly-esteemed and very much in vogue, Raf tomatoes are so representative of Andalucia that two-star Michelin chef Dani Garcia created an award-winning dish called Our Raf Tomato, stuffed with pipirrana, Motril shrimp, green bean juice and aromatised green onion. A Kumato comes with a quality guarantee. Developed in the early 2000s in Murcia, this variety is Spain’s response to consumer’s demand for a tomato with taste. 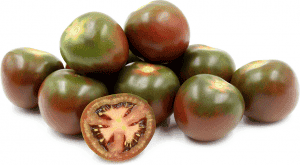 Not your average salad tomato, the Kumato is edible whether ripe or not and, like the Raf, ripens from the inside out, making it intense, sweet, and juicy with a firm texture. 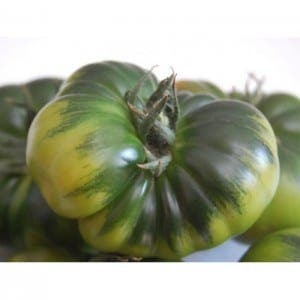 Shiny and perfectly round, it’s often referred to as a ‘black’ tomato, but it’s really a dark shade of green. Kumatoes are a favourite with other Michelin chefs. Joaquin Felipe makes a Kumato tartare with bluefin tuna, Ramon Freixa created a baked Kumato with shrimp tortita and egg yolk and Adolfo Muñoz’s makes a Kumato pisto with serrano ham. It’s easy to confuse green tomatoes with the similar-looking Mexican tomatillos. Here’s the difference: green tomatoes are essentially hard and unripe and have not yet changed colour, with the exception of a few varieties that stay green when ripe. They’re usually sold in the autumn, when temperatures are too cool to fully ripen the fruit. Tomatillos are the fruit of a different plant entirely. They are coated in a sticky residue and protected with a papery husk when picked. Tomatillos have a tart, fruit, and slightly herbal flavor so they are often used in salsas and sauces. 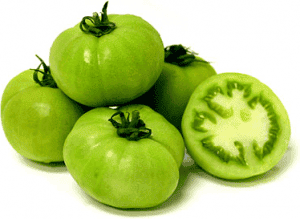 Green tomatoes are firm and tart so they are usually fried or used in pickles and chutneys. Popularised by the Whistlestop Cafe in the movie, fried green tomatoes are a tasty tapa dish and a great option for vegetarians looking for a crunchy treat. But Tomatoes aren’t just for eating in Spain. La Tomatina, held every year on the last Wednesday of August, is the world’s largest state-sanctioned food-fight. 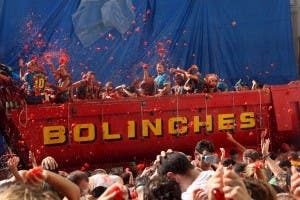 Last year over 40,000 tomato enthusiasts descended on the tiny Mediterranean town of Bunol to pelt each other with over-ripe tomatoes – more than 150,000 of them, turning the streets into a red sea. Low grade tomatoes from Extremadura are used for the ketchup clash and their high level of acidity acts as a disinfectant, leaving the streets squeaky clean. I live in the sierra de Aracena and it is said that the tomato rosado is one of the original tomatoes brought back from the Americas. 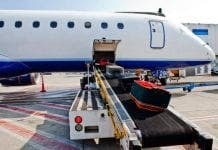 It has a very delicate skin so cannot be transported to markets. Therefore is has to be enjoyed in the places where it is cultivated. The two best aldeas to try them are Calabazares and la Escalada. Hopefully Bill your locally produced tomatoes actually have some flavour which is an attribute I’ve long since missed. It seems to me that growers perhaps under pressure from demand or simply to make more money, have carefully developed tomatoes that look great but have skins like leather & with virtually zero taste.